Type ‘info’ or ‘information’ at the end of any Google search, and the number one result will be the Wikipedia entry of what you are searching for. A clever move from the Googlers, I think. Wikipedia is becoming one of the biggest sites on the net, and perhaps the most relied on source of information. It’s a great way to improve their search results. After all, Google are a search engine company, aren’t they? I got a smile on my dial this morning when I saw this job ad posted in the window of a Trampoline icecream store in Melbourne. It’s a reminder that the best brands aren’t the ones take semselves seriously. Sure, its a lot easier for an icecream shop to use quirky and un-corporate copywriting than it is for a bank or an insurance company. But if your brand acts like a person, your customers are far more likely to relate to you, remember you, and talk about you. I am all over Tara Hunt’s post about the Boutique Generation, all about the movement that we are seeing against the ‘Masses’, that is Mass Production, Mass Consumption and the like. Perhaps human beings aren’t scalable after all. Enjoy shopping at your local pharmacy, grocer, clothing store where you know the owners and feel yourself going out of your way to give them business even if their prices are higher because you prefer to have the personalized service over cost reduction. Like to wear fashions by local designers, buy vintage pieces and buy clothing and jewelry when you travel that nobody else will have, but you always have a story for. Make sure you check out her full post here. The word on the street is that the Aussie icon boots, Blundstones, are moving their manufacturing offshore to Asia this year. They say it’s because “the company can no longer compete against low-cost imports.” Fair enough, you might say. But by doing this, the company signals the beginning of the end of the Blundstone brand. 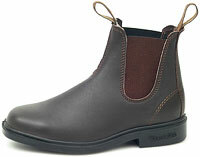 Even a city-slicker like me knows that Blundstone shoes aren’t just a slip on boot. They are made with tender, loving care. They’re an item of pride, passion, and a reminder that “They just don’t make things like they used to”. ‘Blunnys’ are a Lovemark, no doubt. So goodbye to brand authenticity and 120 years of heritage. Farewell to the strong perceptions of pride and passion. Because real marketing, the stuff that makes your customers go ga-ga about your product, is about one word :: Craftsmanship. Making a durable, hard working show in Hobart, Tasmania smells like Craftsmanship. Offshore manufacturing in Asia does not. Blundstone have forgotten this. What a shame. I have no doubt that the company will regret this decision in the long term. If I’m wrong, I am fully prepared to EAT one of their shoes. You heard it here first. What is Web 2.0 really about? Online, you hear the buzzword Web 2.0 all the time. But after speaking to friend today, I was reminded me that not everyone knows what Web 2.0 is, let alone heard the phrase “Web 2.0”. Web 2.0 is all the Web sites out there that get their value from the actions of users. Flickr is one of the greatest examples of a Web 2.0 site. Not because of anything technical like RSS feeds or Ajax interactivity, but because it brings a community of users that share photos together. Del.icio.us is another superb Web 2.0 site. It uses a whole bunch of cool features like folksonomies and tag clouds to enhance the user experience. But without the millions of users, it would be useless. And the uber-terrific last.fm isn’t Web 2.0 becuase of it’s clean design, gradients and pretty buttons. It’s because I can find great new music based on the tastes of other users. Anyone can build a Web 2.0 site, as long as they don’t forget that it is the users, or the community, that makes it Web 2.0. For example, my new-favourite T-Shirt store Threadless, has a Web 2.0 site. They rely on their users not only to submit new T-Shirt designs, but to vote for said designs as well. Long-standing websites like ebay can even be defined as Web 2.0, despite the fact that they have been around since the Web 1.0 days. Why? Because it has connected users together in a way that wasn’t possible before. Interactivity, rich features and good web design only scratch the surface as to what Web 2.0 is all about. The users are the key ingredient. The users are what make Web 2.0 really special. The buzz around the blogosphere today is all about the unveling of Apple’s new iPhone. Steve Jobs announced it at MacWorld in San Francisco today, and Apple’s stock price goes through the roof. Again, Apple seem to have kicked one right between the two tall sticks. But despite our love for Apple, they have a long way to go when it gomes to environmental credentials. For me, and probably thousands of other Mac users across the world, this doesn’t sit right. I Loooove my MacBook and iPod like they were my children. But my loyalty for Apple would be even more cult-like if they were were a little more environmentally friendly. I mean, how can one of the world’s coolest brands miss the mark when it comes to the world’s next biggest marketing opportunity, Going Green? Remove the worst toxic chemicals from all their products and production lines. Offer and promote free “take-back” for all their products everywhere they are sold. Greenpeace have received their fair share of critisicm over the years, but this campaign, designed to raise awareness that Apple are less than green, is a really positive one. Why do I like it? It’s positive protesting. Greenpeace recognise the loyalty that Apple has, and work with that fact, rather than against it. It encourages the Mac creative community to contribute to the gallery by designing t-shirts, alternative ads, videos and the like :: This is consumer-generated-content like no other. They understand the power of social media, and how to use the web to spread the word. (Check out the MacWorld Keynote Parody Video). Now if only Apple listened to its customers and Greenpeace, and made some serious changes to their environmental policies … Only then would Apple be the most invincible brand in history. OK, It’s true – I’m a nerd who spends far too much time reading business books. More so in 2006 than ever before. 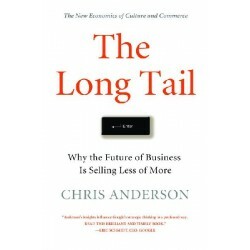 You’ve heard about the Long Tail, unless you’ve been burried under a rock in 2006. But if you haven’t got yourself a copy of this ground-breaking book, do yourself a favour. This, my friends, is the future of business and culture. It’s a truly mind-altering business read. This book is the unnoficial sequal to the Cluetrain Manifesto. Blogging really took off in 2006, and this is the best place to read all about it. I’m sure that if you are reading this blog you have a pretty good understanding of how writing one can help your business. Nonetheless, it contains great examples of businesses that have benefited. I’ve just finished this one off before the year ends. “Small is the New Big” is a great collection of blog posts, articles and the like. 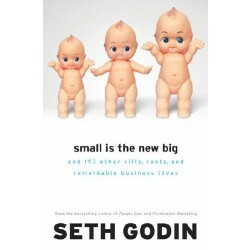 Choc-full of marketing nuggets to inspire you to greatness, as you’d expect from Seth. 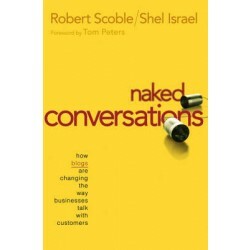 Whether you read his blog or not, this book is worth reading.